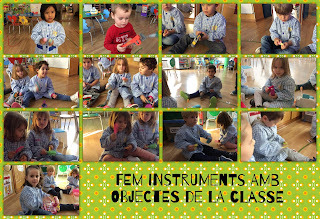 EDUCACIÓ INFANTIL LA MERCÈ P3: P3- TALLER DE CREATIVITAT, FEM MÚSICA. P3- TALLER DE CREATIVITAT, FEM MÚSICA. AL TALLER DE CREATIVITAT HEM DECIDIT INVENTAR-NOS ELS NOSTRES PROPIS INSTRUMENTS, HEM BUSCAT PER LES CLASSES I HEM TROBAT UN TOU D'OBJECTES QUE ENS SERVIEN PER FER MÚSICA: RASCAR PINTES, PICAR CAIXES, OMPLIR AQUESTES DE COLORINS I SACSEJAR-LES, BUFAR UN ROTLLO GRAN DE CARTÓ, PICAR AMB PLATS, A TERRA... HENS HO HEM PASSAT MOLT BÉ, HEM TINGUT UNES IDEES FANTÀSTIQUES!!! 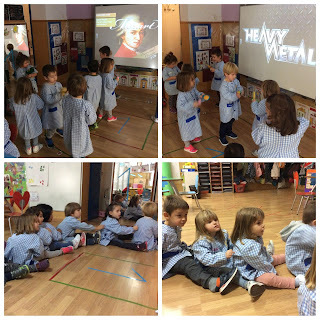 PER ACABAR HEM BALLAT TOT TIPUS DE MÚSICA I ENS HEM RELAXAT FENT-NOS MASSATGES.